We had a wonderful Thanksgiving weekend despite the fact that Olivia was sick. She came down with croup on Tuesday – super stuffy/runny nose, nasty cough, and that scary breathing that accompanies croup. Fortunately we were able to get some medicine in her to keep her comfortable, and she seemed to be just fine for the majority of the weekend despite her symptoms. Unfortunately I seem to have come down with something this morning, although mine seems to be a much lighter version of hers, but at least it waited until after the holidays so I was able to enjoy my food. Thanksgiving with no taste buds does not a good time make. Thanksgiving morning we got up verrrry early thanks to Olivia’s sickness, B ran out and grabbed a newspaper, I made homemade waffles, and then we all watched the Macy’s Thanksgiving Day Parade while devouring the Black Friday ads. Our Thanksgiving mornings look much the same each year, but I sure do love our traditions. We did have a little mishap Thanksgiving morning when Olivia stumbled and fell into the side of the couch. Instead of hitting the 90% of it that’s soft, she hit her face on the 10% of it that’s hard and she started screaming. I jumped up and there was blood pouring from her nose as well as a pool of blood in her mouth. My heart sank and my first thoughts were that we were going to spend Thanksgiving at the hospital, but fortunately after cleaning her up and rinsing out her mouth, we discovered there was no major damage. I’m honestly not even sure where all of the blood came from. She did, however, get a scrape above her lip, so for the rest of the pictures in this post, you’ll see her battle wounds. Poor thing. At noon we met my father-in-law at the country club for Thanksgiving lunch. It is one of the best meals of the entire year and I look forward to it every single year. We dined on ham and turkey, stuffing, green beans, sweet potato soufflé, fingerling potato salad, fresh fruit, a ton of other things that I didn’t even have room for on my plate, as well as a gazillion different desserts. I may or may not have had a slice of pumpkin pie, a slice of key lime pie, and two chocolate chip cookies. After lunch, we took a walk along the river, another tradition of ours. The weather was perfection and it was truly a beautiful day. Such a picturesque walk through our little town. After our walk it was back home for some to rest, and for others (ahem, me) to start preparing for our Thanksgiving dinner later on in the day. I made my mother-in-law’s hot pineapple casserole (I really need to post this recipe soon… it’s incredible), and while that was baking I finished up our Christmas chalkboard for the kitchen. We stuffed ourselves until we couldn’t possibly eat any more, and then we all sat around chatting and catching up. Olivia is completely obsessed with hairstyles so she went from girl to girl (mostly between my cousins) and “styled their hair.” I wish I had snapped a few pictures because it was just too cute. We also Facetimed with my brother and sis-in-law and my nephew and then we took a few family pictures. Here’s my mom with all of her siblings and their mom (my grandmother). And here is my mom with all of her sisters and their mom. Can you tell that I’m related to all of them? We stayed way too late and got the kids in bed way too late, and then went home, watched some Gilmore Girls, and called it a night. It was Thanksgiving perfection and I am oh so thankful for days like those. Friday morning was spent cleaning the entire house top to bottom – sweeping, mopping, dusting, vacuuming, cleaning counters and toilets, etc. – in preparation for the Christmas season. Once the cleaning ended, the decorating continued! I got some new stuff from Hobby Lobby for our formal dining room and I am head over heels for how it turned out. I can’t wait to share it with you next Tuesday! We went out to Five Guys for lunch, and then we went and picked up a Christmas tree. It was unseasonably hot again, but we made the most of it as we were sweating and whining. Haha. Friday afternoon we put Olivia down for her nap and I spent the next two hours putting the lights on the tree so it would be prepped and ready for decorating later that night. We had Olive Garden for dinner since we were over all of the Thanksgiving food, and then it was time to go home to decorate the tree. I shuffled my Christmas mix and we pulled out the ornaments. The kids took turns hanging them (all in the same place, might I add) and I had the best time reminiscing as I unwrapped each one. Each ornament on our tree tells a story, and every year it always makes me so happy hanging up the same ornaments that we have been hanging for years… some for 30+ years! Once the tree was up in all its glory, our elf, Cheek, made his appearance and we read our Elf on the Shelf book before sending the kiddos to bed. 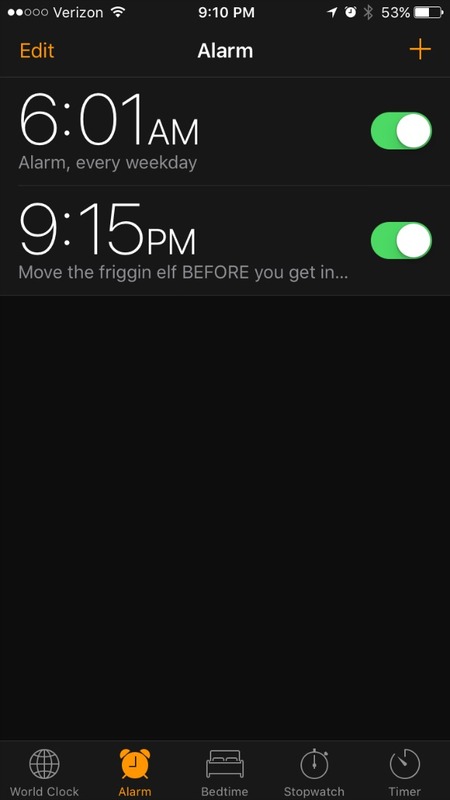 And since Cheek is back, that also meant that I had to set the ol’ alarm again so we won’t forget to move him every night. WHY is it so impossible to remember to do that?! Saturday morning was spent putting up the outdoor Christmas decorations, and then it was off to my mother-in-law’s house for Thanksgiving numero tres. B’s step-sister and her husband and family were in town, and they had brought their dog along. Olivia loved him so much. She chased him all over the yard, threw his ball over and over and over, and kept hugging him every five minutes. She would have taken him home in a heartbeat if we would have let her. And on a side note, she requested a ribbon in her hair – not a bow – for Thanksgiving lunch, so I put one of my old ribbons in her hair… so crazy that I used to wear that same ribbon when I was younger! We stuffed our faces again for meal number three and I may or may not have had a piece of pecan pie, a snickerdoodle, a brownie, and three homemade chocolate chip cookies for dessert. What can I say? I heart dessert. The rest of Saturday was spent watching football, working on a new craft (coming to the blog soon), and not eating... Brian and I fed dinner to the kids, but he and I skipped it and just made a cheese plate instead. I don’t think I could have eaten another bite of ham or turkey if I tried. Sunday morning we headed back over to my mother-in-law’s house to celebrate my nephew’s birthday. Since everyone was tired of regular food at that point, they had a brunch instead of lunch – eggs, grits, pancakes, sausage, bacon, hash browns, donut holes, and fresh fruit. Yes, I ate a ton again, but it was a nice change of pace from all of the other Thanksgiving food. Did I mention we had birthday cake, too? <Insert cringey-face emoji here> I think I probably gained five eight pounds this weekend. After the birthday cake was devoured and the presents were opened, B’s momma and sisters plus all of the cousins went to a new entertainment complex that just opened here. They have bowling, bumper cars, and an arcade. Jacob was in heaven. He had been begging to go there for the last few weeks, so he didn’t even know what to do with himself! He played game after game, and Olivia even joined in on a couple of them. There wasn’t much for her to do there, so she and I headed out after about an hour so she could go down for her nap. Sunday evening was spent at my momma and daddy’s for Sunday dinner. Yep… more food. Ranch chicken pasta, honey glazed carrots, and sautéd brussel sprouts with bacon. I ate it all up… and now I need to go to the gym every day this week. I hope your weekends were filled with family, fun, and food food food like ours was! Happy Tuesday! Looks like y'all had a busy but sweet holiday weekend together! Can't wait to see your decorations! You had a GREAT holiday weekend!! I love all of the traditions and family fun. Minus Olivia's croup and fall i'd say it was downright perfect! Oh girl, ALL THE FOOD. Makes me so hungry - I love all the desserts you had! 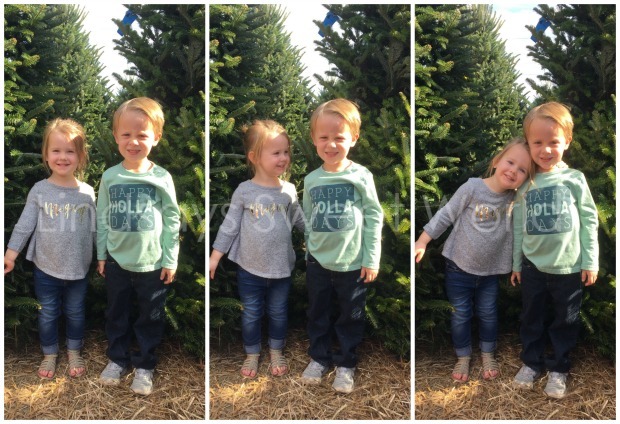 The picture of the kids with your master tree is beyond precious. I know I have said this multiple times, but I love that you have your old wedding ornaments to decorate it with. Such a cool idea. Your Thanksgiving and whole weekend really, sounds like perfection. So glad it was a good one! Look at all this goodness! Just reading this and seeing all your precious pictures makes me feel even more festive! I'm so sorry Olivia was sick and that you're not feeling good today. My husband and I were sick for three weeks, it was so hard to get rid of which is even more difficult for me because I'm go go go and am hardly ever sick! Completely cracks me up about moving the elf, LOL! Merry merry Christmas season beautiful, I hope this week is going great for you! Thank you, Andrea! And oh my goodness, 3 weeks?! That is such a long time! Hopefully you'll be good to go for the rest of the season after that one! No more sickness for you! Sounds like you and your family had a great Thanksgiving. Glad Olivia is feeling better. I love the timer on the phone :) Have a great day! Thank you, Jenna! And yes, without that alarm, we would forget every. single. night. Haha. #1 I can't wait to see your tour #2 I think I gained 8 pounds too #3 I freaking LOVE dessert. I had multiple pieces of cheesecake this weekend... and pie too! #4 When your ready for a new Netflix show I have a good one for you, Longmire. Oh my word I am in love with this show and I now have an old man crush. I'm hungry just reading this post! And thanks to you I remembered to move our elf this morning before the kids woke! I'm so sorry Olivia was sick and poor girl hitting her face! It still sounds like the best weekend jam packed with family time, the best! What a GREAT Thanksgiving! Your tree is beautiful! Can't wait for the link up on Tuesday!! I can't stop watching Gilmore Girls!! Thanks, Heather! I can't wait to see your house! And I can't stop watching GG, either! It's really good! I hate that I'm so behind that it's going to be a while before I can watch the new ones, though! Woohoo, so much fun and food! It sounds like you guys made some awesome new memories and kept traditions alive too. Also, I'm in love with Olivia's Thanksgiving dress. So adorable! So glad that you got some meds for O so that she could participate in the many festivities this weekend! You guys seriously do the best stuff as a family, I love it all! Sounds like the perfect Thanksgiving! I love the dress you wore to lunch that day. Adorable!! I'm totally intrigued by the pineapple casserole dish. I don't think I've ever had anything like that. Poor Olivia was having a rough start with the sickness and the injury! Poor girl! I'm glad you had a wonderful Thanksgiving! Lots of family and food, sounds perfect to me! Sounds like a great Thanksgiving weekend though. My girls always seem to run into things too. I hope Olivia is healing well. And that your cold goes away fast. Love all the food and dessert you had all weekend. I did the same and I have been hitting the gym hard. Bucket list success! I forgot to say that Ben has those same Santa jammies. I love them so much! They look so adorable on Jacob. I love that you have a Christmas tree in the master bedroom! So sorry for Olivia’s accident. Poor sweet girl! I am glad she’s okay. I am loving that Merry & Bright sign. Hobby Lobby is the best. I adore all of these pictures!